In his book, Thomas Piketty recommends an 80 percent marginal tax rate on income in the United States to address inequality. Though an 80 percent tax rate may very well succeed in taking more from those at the top, but the United States already has the world’s most progressive tax system (the top 25 percent of taxpayers pay 85.6 percent of federal income taxes). Additionally, it would have a highly distortive effect on the economy, especially in a country where 54 percent of all business income is earned through the individual tax code. An 80 percent would only make these matter worse and wouldn’t be wise policy—tax policy should be neutral and allow the economy to grow. “Fortunately, there are much better ways to address rich-country inequality while still fostering long-term growth in demand for products from developing countries. For example, a shift to a relatively flat consumption tax (with a large deductible for progressivity) would be a far simpler and more effective way to tax past wealth accumulation, especially if citizens’ tax home can be linked to the locale where their income was earned. Now, an 80 percent tax rate or a progressive consumption tax aren’t the only suggested ways to address inequality—other suggestions include fixing the high marginal tax rates created by the phase out in the EITC, eliminating the payroll tax for lower income individuals, or implementing new wage subsidies. Of the options, a progressive consumption tax to replace the income tax is likely the best options. It eliminates double taxation and is neutral between consumption and saving. But even still, these policy suggestions misplace their focus on inequality instead of economic growth. Instead of trying to rearrange the slices of a fixed pie, policymakers should focus on increasing the size of the pie—i.e. find ways to maximize economic growth. Good policy would make it easier to start and grow businesses, create jobs, and lift wages, and these aims should be the focus of policymakers. From a tax perspective, this includes limiting our tax code’s biases against saving and investment, as we’ve seen done in other developed countries (such as Canada, which is now home to the world’s most affluent middle class). 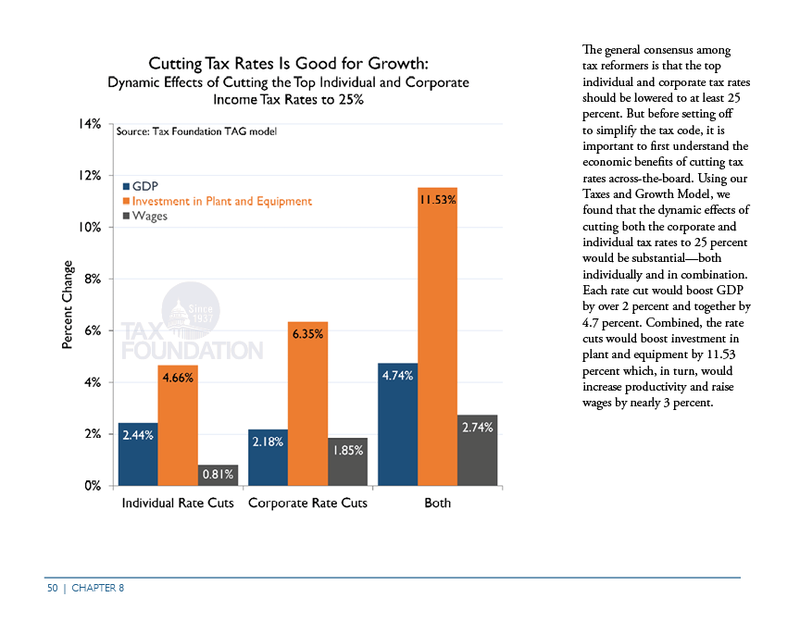 A couple of options would be to lower the corporate tax rate, lower the top individual rate, move towards full expensing, shift to a territorial tax system, and integrate the corporate rate with (or lower) the dividends and capital gains taxes. These changes present far better options for addressing inequality than an 80 percent tax rate, and they address it the right way: by giving opportunity to those at the bottom, instead of taking more from those at the top.